In this episode, the hunters intervene in the case of a Digimon gaining power through a popular collectible card game... but only after it completely drains the energy of its victim. Twice. Hunters is all over the place when it comes to the subject material of its filler. As a result, it's easy and fun to throw in visuals or lines from something like a cooking competition or a ghost investigation. One thing the show never quite stoops to, however, is parody. No matter how inane or boring or pointless the situation the kids find themselves, in, they handle it with a measure of respect. In Tagiru's case, there's usually unbridled enthusiasm as well. This might be the first time the lack of denigration is really noticeable as we face an episode where a crisis hits the world of collectible card games. Just hearing that makes you assume that this whole episode will be mocking Yu-Gi-Oh. You can already picture a riff on the visual style of its card battles to the preposterous contrivances making every duel a life-or-death affair to the dramatic and sometimes impossible arenas. Instead, Hunters plays it completely straight. The kids playing the game are totally serious, but participants in your local game store's Magic: The Gathering nights often are. They want better cards, they want to improve their rank, and they're appropriately upset when they unfairly lose either of the two. Even the visual style of the cards is unrecognizable. These Sea Monster Cards are bland and don't seem to ape any particular system. 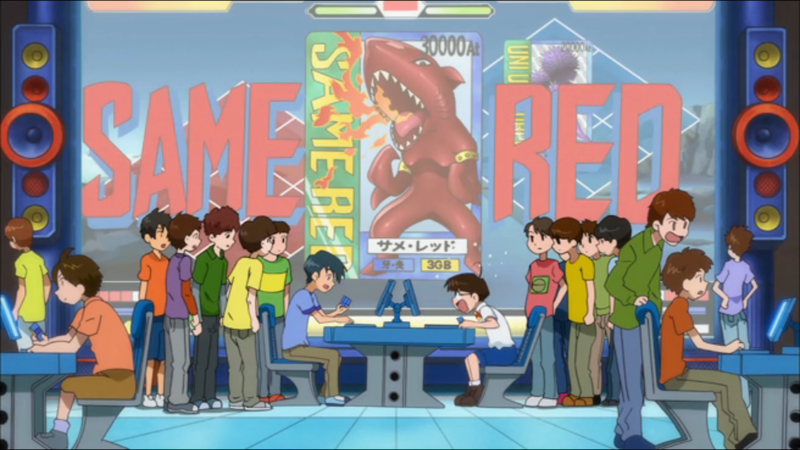 It definitely doesn't try to elevate the prominence of Digimon's card game. No season, not even Hunters, would be stupid enough to try pulling that off. That lackadaisical attitude is the only reason there's any drama to speak of. They monitor a match and correctly identify a likely target- the nerdiest bow tie-wielding kid you'll ever see... until tri. comes out. They follow him into DigiQuartz and watch as KnightChessmon attacks him and steals the cards. And then... Tagiru sends Gumdramon out for a short curbstomp of a battle. KnightChessmon pummels him and retreats. Tagiru doesn't bother evolving him or using a digixros. 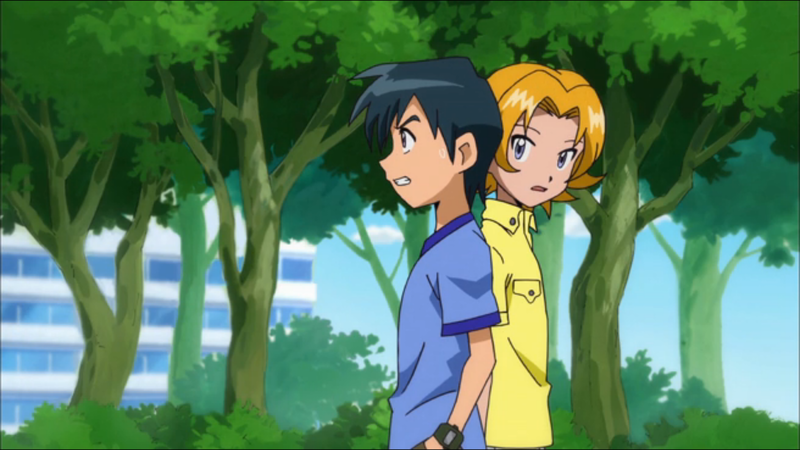 Taiki and Yuu aren't concerned enough to bother cutting escape routes. Hiroya gets away and the hunters just sort of forget about the problem for a couple days. Yuu merely gives Hiroya a stern talking to. That oughtta do it. Thanks very much, Yuu. In that time, of course, KnightChessmon continues drawing on Hiroya's greed unabated. How much do the hunters drop the ball? He finishes with Hiroya, evolves to RookChessmon, and finds a new victim. Then he finishes with that victim and starts on a third! It's only at this point, with RookChessmon growing to the size of a building, does Yuu decide that they should probably do something about this. After Arresterdramon fails to do anything against the giant castle, Yuu takes over and engineers a victory using some of Tagiru and Taiki's secondary Digimon and Damemon's... unusual move set. Normally we would be applauding such creativity in ending a fight. It even ties into the narrative as Yuu maintains that a good strategy can beat the rare cards that all these players are fighting over. But trying to convince us that the likes of Blossomon and the Pickmons can actually restrain RookChessmon is a hard sell. And there's no way sitting back and letting a manageable KnightChessmon turn into a near-invincible fortress constitutes intelligent strategy. Someone explain these terminals to me. They look advanced and expensive, so are they only configured to run this niche card game? Are the terminals required to play the game... which would mean it's not really a card game and instead a video game? And those face-to-face systems suggests that all the other machines are for online play. So... they go to a dedicated Sea Monster Cards parlor in order to play a game that doesn't require actual human interaction. Sounds pointless. Did a girl call Hiroya cute once his rank started to climb? Do card players have groupies now? As calm as Yuu is throughout this episode, it makes it that much more hilarious when he absolutely loses his mind to see all the rare cards in that battle, and even better with Tagiru trying to match that intensity without actually knowing what's going on. On that note, how fair is this game if cards with a 20,000 attack value are considered rare, but other cards go up to a million? What's a common worth? Why does Yuu refuse to tell Taiki that Hiroya is responsible for the attacks? He owes that kid nothing. No thoughts on KnightChessmon's part? I thought he was one of the few saving graces of the episode, given how he so coolly manipulates Hiroya for his own gain, and then he points out how much alike they are, all shortly before doing the exact same thing to the kids. Given how petty the kids' issues were, though, his much more traditional power-seeking at least made things respectably dark. Hiroya looked like hell after KnightChessmon finished with him. It definitely doesn't try to elevate the prominence of Digimon's card game. No season, not even Hunters, would be stupid enough to try pulling that off. I thought Tamers did a good job of integrating the cards into its setting, considering it was almost certainly a marketing ploy. 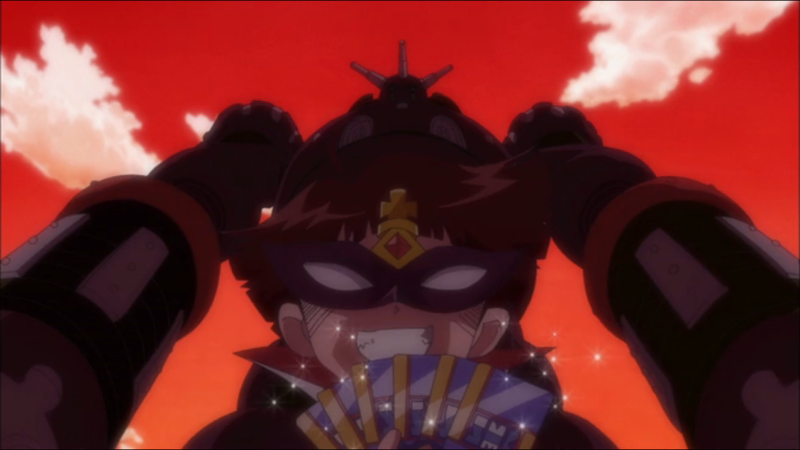 Not only did it enable the kids to get more directly involved in the battles early on, but it paved the way for the later concepts like Shibumi's blue cards, the Ark (and later Grani), and the explanation for how the DigiGnomes used the digivices to grant the childrens' wishes (because Shibumi designed the digivice as a data interface, which gave them a window to reality). This episode really needs to be given the Abridged Series treatment.